On arrival by you will be met at the Airport and transferred to Bishkek. Short photo tour in Bishkek. Drive to Chon Kemin Gorge popular tourist destination for its beautiful unspoiled nature. On the way excursion to Burana Historical Complex consisting of Burana Minaret - the ruins of ancient city of Balasagyn, open air museum and mausoleums; International University of Central Asia. Horse games and competition - the favorite type of entertainment of Kyrgyz people in the past. Upon arrival to Chon Kemin you will be accommodated in Kalmak Ashu guest house that is owned by a local Kyrgyz family (private bathroom in room). Enjoy beautiful nature landscapes, fresh air, delicious homemade meals, and communication with a friendly family; experience the lifestyle of rurals. Dinner and stay overnight at the guest house. Breakfast at the guest house. In the morning excursion around Chon Kemin Gorge by horses - the motherland of the Kyrgyz hero of 19 century Shabdan Batyr. Enjoy beautiful mountain landscapes and coolness of Chon Kemin River. Excursion to Shabdan Batyr Museum. Drive to Bokombaevo village alongside the picturesque south shore of the lake Issyk Kul. Arrive and accommodation at home of famous berkutchi (a person who breed and train hunting birds) and dinner. Experience eagle hunting show - feel the hunting spirit as you watch how the Kyrgyz eagle hunter (berkutchi) catches a small animal with a hand-trained hunting bird. Overnight at the local family. After breakfast at the guest house drive via numeral small villages, fields and fruit gardens to Ken Suu Village - a small farming village located in the north eastern corner of Kyrgyzstan, on the slopes of Ala-Too Mountain Range. Excursion to horse farm and show of pure-breeding horses. 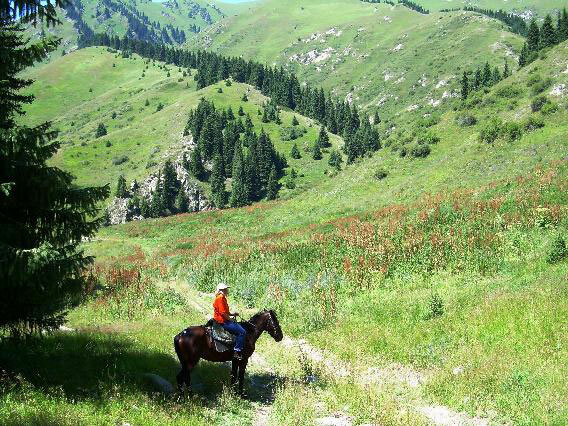 On the way: excursion to Jety Oguz, on of the most picturesque places in Kyrgyzstan famous for the thundering water falls, fancy rocks, coniferous woods and alpine meadows. Short city tour in Karakol covering Dungan Mosque that was built in 1910 by the local Dungan community that escaped Chinese oppression as a house of worship; Russian Orthodox Church and Kupecheskii Proezd Street that imitates 19 century style. Local Kyrgyz family will welcome and host you at their home. Dinner and stay overnight at home stay. Full day in Ken Suu. -	Excursion to Kol Tor Mountain Lake. Lunch, dinner and stay overnight at home stay. Breakfast at the guesh house and check out. Today you will have a long drive to Kazakhstan via Kyrgyz-Kazakh border. Enjoy beautiful landscapes on the way (meadows, snow peaked mountains, small villages, Charyn Canyon, Karkara valley). Stop at Charyn Canyon for picnic lunch. Charyn Canyon commonly referred to as Valley of the Castles because some of the oddly shaped rock formations look like towers. It is one of Kazakhstan's finest nature spots. The canyon was formed over centuries with the Charyn River, a large river that runs through the Tien Shan Mountains. Upon arrival, check-in at the hotel and rest. Stay overnight at the hotel. After breakfast short City tour: city center, main streets, Panfilov Park, Republic Square, New Square with Monument of Independence, Academy of Science. Today you will also have an excursion to eagle farm and watch eagle hunting show (at 05.00 PM every day except Monday).